Scott Nicolay featured at Arroyo’s Oct. 7th at 6 p.m. The Telluride Institute’s Talking Gourds guest performer for Tuesday, Oct. 7th will be Farmington horror writer and spelunker/poet Scott Nicolay at Arroyo’s at 6 p.m. Be prepared to be scared. To wriggle through Frankensteinian rips in the fabric of our shared Time Wave continuum. Scott will be our introduction into this year’s Telluride Horror Show Oct. 10-12, the state’s oldest horror film festival. He’s a scholar of the Rapinui, a habitué of the underground, an adept at kava kava, the father of a Diné daughter and one of the more interesting writers in the American Southwest. Come entertain your fear (which will be our club theme this month). 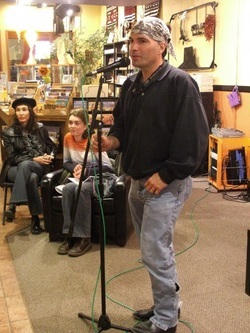 Joe Hutchinson has been named Colorado’s new Poet Laureate, stepping into the shoe’s of last term’s honoree, David Mason. We hope to be able to bring Joe to Telluride next year. Talking Gourds Poetry Club is a joint venture of the Telluride Institute, Wilkinson Library, Between the Covers Bookstore, Arroyo Telluride and the newly formed Telluride Literary Arts TLA. Members meet monthly, on first Tuesday evenings, at Arroyo Fine Art Gallery & Wine Bar at 220 E. Colorado Ave. (next door to Telluride Hardware and the Masonic Hall), beginning at 6 p.m. in Telluride, Colorado. TLA also sponsors the annual Telluride Literary Arts Festival the weekend before Memorial Day weekend.